Welding of monopole complies with AWS D1.1 standard. monopole is jointed with slip, flange mode. Base plate is square/round/Polygon with slotted holes for anchor bolt and dimension as per client`s requirement. Customer`s complete satisfaction is our goal. Quality is employed at every stage of production to ensure the product compliance to the specifications/standards. Careful inspections are carried out by highly trained inspection engineers as per the defined procedures from raw material stage to finished product and delivery. Prototype assembly of towers is carried out in the plant. Galvanizing is done according to international standards.The galvanising is in accordance with ISO 1459 and ISO 1461 and is not less that 600 g/square meter of steel surfance area. Looking for ideal Mobile Phone Steel Pole Manufacturer & supplier ? We have a wide selection at great prices to help you get creative. 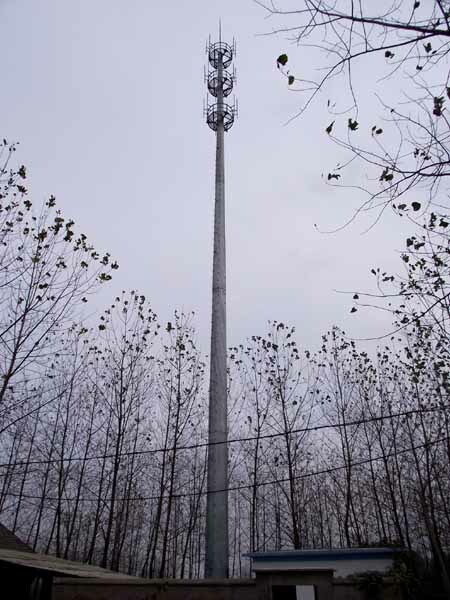 All the Communication Steel Monopole Mast are quality guaranteed. We are China Origin Factory of Galvanized Steel Mast in 45m. If you have any question, please feel free to contact us.